The Beagle Freedom Project seeks to proactively support ground-breaking research that can yield more relevant, reliable, and predictive data to improve human health. Beagle Freedom Project is calling on the scientific community to "Upgrade Your Research" with innovative, effective, and humane alternatives to animal models and methods. In this way, the Beagle Freedom Project seeks to proactively support ground-breaking research that can yield more relevant, reliable, and predictive data to improve human health. 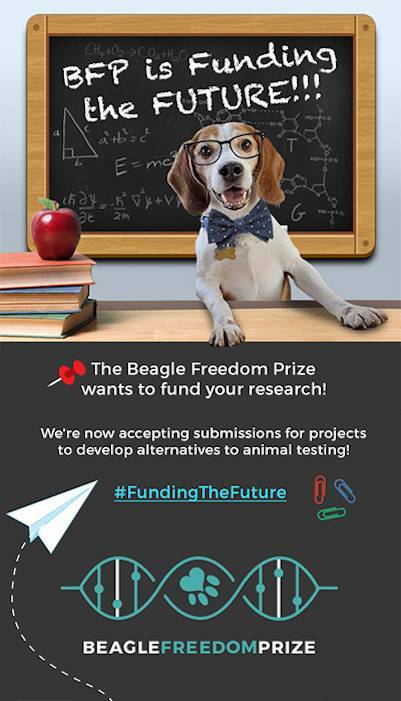 Beagle Freedom Project (BFP) will award $250,000 in grants to applicants whose goal is to replace the common use of dogs and other animals in research, testing, and/or education with a non-animal approach, such as in-vitro and in-silico methodologies, amongst others. A total of five possible awards of $50,000 are scheduled, or larger sized grants are available to fewer awardees depending on the nature, merit, and need of the winning proposals. Thank you for your interest in the Beagle Freedom Prize and for your commitment to advancing science through finding alternatives to animal models.